Hey, you guys! Here’s everything you need to know about Richard Donner’s adventure classic. 1. THE FILM WAS MOSTLY SHOT ON LOCATION. The movie shot almost entirely in sequence in Astoria, Oregon on a 5-month shooting schedule. Other locations, like the tunnels and the cave with One-Eyed Willy’s pirate ship, were shot on massive soundstages in Burbank, California. 2. IT’S JOSH BROLIN’S MOVIE DEBUT. Brolin, who would later star in films like No Country For Old Men and Milk (for which he was nominated for an Oscar for Best Supporting Actor), got his start in the business as Brand in The Goonies. 3. IS IT BRAND OR BROLIN? In a small goof, Sean Astin (who plays Mikey) calls Josh Brolin by his actual name, not by his character’s name, in the scene after Chunk breaks the water cooler in the basement of the abandoned restaurant. 4. CHUNK IS STILL IN THE MOVIE BUSINESS, BUT NOT AS AN ACTOR. Chunk is Jeff Cohen’s only live action feature film role to date. He left acting to pursue a law degree and is now a founding partner at an entertainment law firm. 5. SEAN ASTIN’S ONE-EYED WILLY SPEECH WAS TECHNICALLY IMPROVISED. To get a more naturalistic performance out of Astin in the scene in which he tells his fellow Goonies about the legend of One-Eyed Willy, Donner had the child actor improvise in an offbeat way. Donner simply told Astin the story moments before they shot and had the actor tell it back to him as best as he could with cameras rolling. 6. THE TREASURE MAP WAS SPECKLED WITH REAL BLOOD. Production designer J. Michael Riva thought the prop treasure map looked too new, so to make it look over 300 years old he spent an afternoon aging it. After pouring coffee in the map, he wanted to add blood, but the prop department was out of paint. In a quick bit of improvisation, Riva cut his finger and dripped his own blood along its edges. 7. SLOTH WAS AN ACTUAL TOUGH GUY. John Matuszak, who plays Sloth, was the first overall pick in the 1973 NFL draft and won two Super Bowls with the Oakland Raiders before turning to acting. As a nod to Matuszak's former team, Sloth can be seen wearing a Raiders t-shirt early in the movie. 8. SLOTH’S OTHER SHIRT IS A NOD TO DONNER. At the end of the movie, Sloth triumphantly rips his vest and other shirt off to reveal a Superman t-shirt underneath, which works well within the context of the scene but also serves another purpose. It’s an inside joke about director Richard Donner, who rose to fame after directing Superman: The Movie in 1978. 9. IT TOOK A LONG TIME FOR MATUSZAK TO BECOME SLOTH. Makeup artists needed five hours every morning to transform the football star into Sloth. 10. SLOTH LOVES ERROL FLYNN. The pirate movie he watches while chained in the basement is the 1935 Errol Flynn adventure Captain Blood. 11. THE FRATELLIS LOVE OPERA. 12. CHESTER COPPERPOT MAY OR MAY NOT HAVE BEEN A VETERAN ACTOR. Though it’s uncredited in the movie, the photo of Chester Copperpot is alleged to be of American actor Keenan Wynn. Wynn was originally cast as Perry White in Donner’s Superman movie before dropping out due to exhaustion. 13. THE BATS IN THE UNDERGROUND CAVES WERE CREATED USING SOME MOVIE TRICKERY. The “bats” were actually just bowties and wads of black paper mache blown out of air cannons. 14. THE MOVIE TAKES PLACE IN THE SAME UNIVERSE AS GREMLINS. Believing Chunk is pranking him over the phone again, the police officer Chunk talks to recalls one of Chunk’s stories about “little creatures that multiply when you pour water on them,” which is a reference to the movie Gremlins. Steven Spielberg was an executive producer on both films, and screenwriter Chris Columbus wrote both movies as well. Corey Feldman also appeared in both movies. 15. SPIELBERG DIRECTED A FEW SCENES HIMSELF. In addition to serving as executive produce and receiving a “Story by” credit, Spielberg also secretly directed the scene in which the Goonies bang on the underground pipes as well as the wishing well scene. 16. THE SLIDE AT THE END WAS REAL. The slide the Goonies ride to get to the cave with One-Eyed Willy’s ship was a fully functioning waterslide (the end credits thank the Langford Surf Coaster Corporation for building it). Donner and the crew would allegedly sneak in after filming wrapped for the day to ride the slide. 17. THE GOONIES’ REACTION TO ONE-EYED WILLY’S SHIP IS GENUINE. Donner denied the child actors access to the massive soundstage where a full pirate ship was built. The scene in the final movie is their actual reactions to seeing it for the first time. The ship took two months to build, and was supposed to resemble Errol Flynn’s ship from the film The Sea Hawk. 18. MOUTH WAS CALLED MOUTH FOR A REASON. Not only was Feldman’s character appropriately named because he talked a lot, but the name fit for another reason. The scene where Mama Fratelli pulls the jewels out of Mouth’s mouth was shot in one take with Feldman managing to fit all of the jewels in his mouth at once. 19. DATA MENTIONS A SCENE THAT WAS CUT FROM THE MOVIE. Sharp-eared viewers will notice that Data mentions that “the octopus was very scary” to the reporters at the end of the movie. No scenes involving an octopus are in the final cut of the movie. The line refers to one that was cut which involved Stef and Mouth getting attacked by an octopus after they flee One-Eyed Willy’s ship. 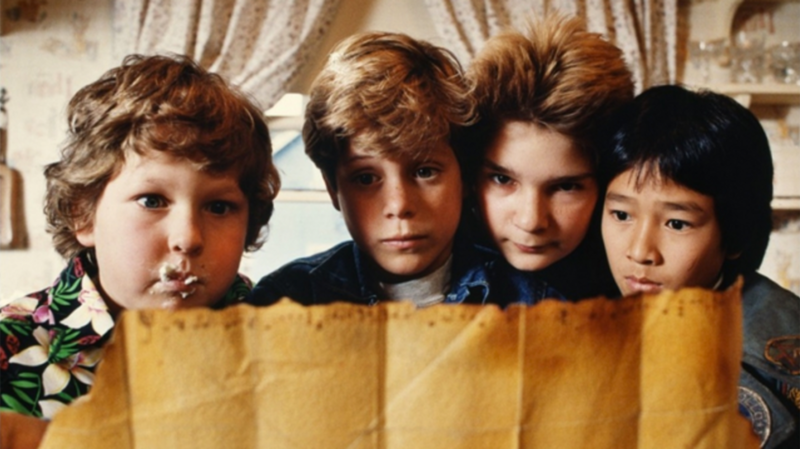 The mayor of Astoria, Oregon named June 7th “Goonies Day” in honor of the movie, and the town hosts an annual celebration.